Cookie Mountain is a level in World 4 (Twin Bridges) in Super Mario World. The player encounters large swarms of Monty Moles in this level. Completing this stage gives access to #4 Ludwig's Castle. This level also marks the first appearance of the Sumo Brother, an enemy which stomps the ground to create a fire obstacle in Mario's path. They cannot be stomped, but they can be hit from below or cape-spun to be destroyed. Yoshi can also be found in a red ! Block if the player has previously hit the red switch in the Red Switch Palace. 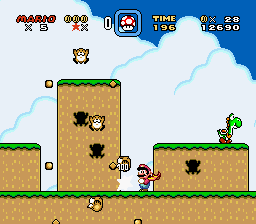 At the beginning of Cookie Mountain, the player encounters a Koopa without a Shell sliding down a hill, followed by two Monty Moles. After crossing a short gap, the player encounters a Sumo Brother who stomps, causing fire to spring up beneath his platform. There is also a Monty Mole beneath the platform. The next section has five slanted platforms: the first slanted away from the player, and the rest slanted towards them (there are also sliding Koopas without Shells on the second, fourth and fifth platforms). 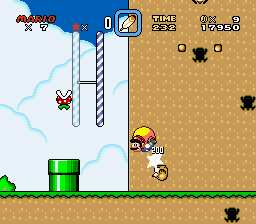 The player also finds the first Dragon Coin above the second slanted platform. After progressing upwards, the player sees a staircase-like structure with four Monty Moles who jump out. Afterward, if the player is Caped Mario, flying up leads to a cloud platform where a 1-Up Mushroom is obtainable. If the player opts to go below, the next mountain contains four more Monty Moles who jump out in quick succession. The level begins to get difficult here as the player must maneuver past two hard-to-reach Sumo Bros. and a Monty Mole below (the second Dragon Coin is easily noticeable below the first Sumo Brother). After a Jumping Piranha Plant, the Midway Gate appears. A very large mountain up ahead has four Monty Moles that emerge if one stays to the ground and another two if they climb the vine upwards (located in third block to the near right). If the player decides to use this vine, they can find the third Dragon Coin, plus a 1-Up atop the mountain. If the player then decides to go to the blue pipe, they find a water sub-area. The player must go left instead of right and they find two Porcu-Puffers following Mario and some coins. After avoiding the Porcu-Puffers and continuing left, the player finds a green-mushroom platform with a red pipe above it. Soon following the red pipe, there is a Monty Mole and a ? Block surrounded by two Note Blocks. The player can only obtain the Yoshi within if the red blocks are activated from the Red Switch Palace, since this is the only way to hit the blocks below. There are three mini-mountains ahead containing a total of four Monty Moles and the fourth Dragon Coin atop the second mountain. If the player manages to find the Yoshi, they are able to obtain a power-up of any choice from the box located at ground level. The second of three silver pipes contains a Jumping Piranha Plant. The final Dragon Coin is above either a gap or green blocks, depending on the status of the Green Switch Palace, followed by a small platform and either another gap or red blocks. The upcoming section has two Sumo Bros. on two levels of Item Blocks, both attempting to hurt and/or halt the player. Finally, the player needs to defeat a Chargin' Chuck and arrive at the Giant Gate. This page was last edited on April 5, 2019, at 22:58.